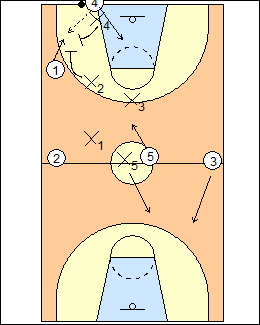 1-2-1-1 fullcourt press, trap on the inbounds pass (thumbs down), keep trapping on a perimeter pass, the press is broken on a gut pass or penetrating dribble, fall back into a man-to-man or zone defence. X4 is on the ball, shading middle. X2 takes the first attacker on the left, in an intercept position, pushing 1 towards the baseline. X3 covers the area on the right back to the top of the 3-point line extended, denying any attacker in his square. X1 matches up with the next ballside attacker. X5 has the last attacker, and is always the safety. Option - deny the inbounds pass. Alan Lambert - it is simple to fall back into a 1-2-2 or 3-2 zone. See Defences - 1-2-1-1 Tennessee, Maryland, Canada, Alan Lambert, also Kentucky and Thumbs up (trapping off the dribble). X2 and X4 trap an inbounds pass to 1, X1 and X3 are the interceptors, protect strongside and middle, X1 covers the sideline. Bruce Pearl - don't trap an inbounds pass to the weakside, it's too far for X4 to run. Billy Tubbs - always trap the inbounds pass, even to the long corner. Interceptors X3 and X1 are guarding three attackers, they read the passer's shoulders to position themselves. X3 may be able to steal a pass back to 4, but don't give 5 the middle of the floor. 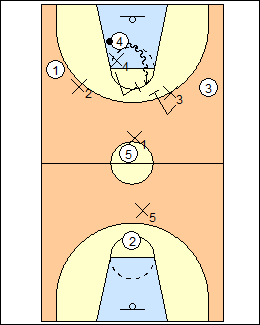 Variation - X3 moves up to cover ball reversal, X5 covers 5, leaving open a skip pass to 3. 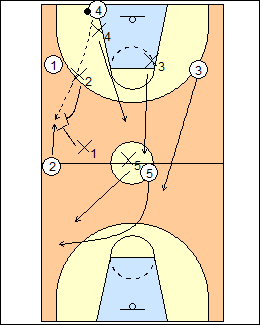 Canada Basketball - a pass back to the inbounder is often least contested by interceptor X3, especially if the inbounder is a post player who is not a threat to dribble the ball. Vivian Stringer - X1 becomes the thief, always behind the trap. Trap again on a pass up the sideline, X1 traps with X2, X3 and X4 are interceptors, X3 covers a sideline attacker, X5 remains the safety. See Defences - Billy Tubbs fullcourt zone, 2-2-1 Hubie Brown. A coaching option is "one and done" - sprint back into the halfcourt defence on a completed pass out of the trap, or defenders are unable to set the trap. Jim O'Brien - the press stays on for any backward pass. 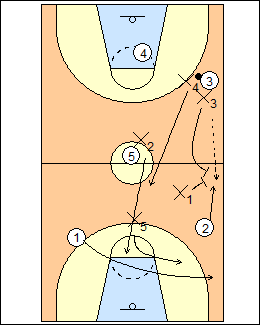 Get back to a 1-2-1-1 set on ball reversal to 4, X1 mirrors the ball, covering middle, X5 protects the basket (4 could throw long, he is not double-teamed). 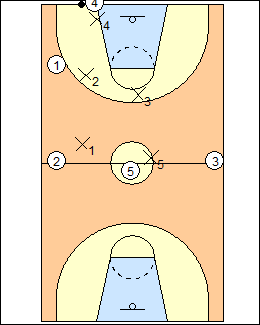 If 4 is an early match-up, pressure the ball, make him put it on the floor, X2 or X3 will trap with X4. 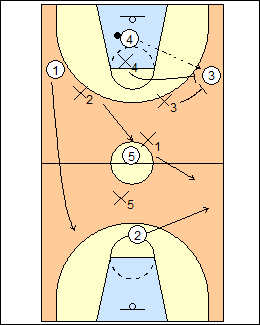 If 4 is a dead match-up, get in the passing lanes, make him make a play. Rick Pitino - if the inbounder is the other team's center (their 5), the diamond moves back and plays the passing lanes, otherwise the inbounder is pressured, encouraging an uncontrolled dribble. Dean Smith - usually the inbounder is a big not known for his dribbling ability, if the inbounder is a dribbler, X4 could contain him with help from X2 and X3. See Defence - 1-2-1-1 thumbs up (trap if 4 drives the ball). If 4 passes to 3, X3 and X4 trap, X1 covers the sideline. See Defences - 1-2-1-1 Kentucky, Alan Lambert, also Canada (X5 covers the sideline). If an inbounds pass is made over X2 to 2, X2 can come back to double-team with X1, X4 and X3 are interceptors. 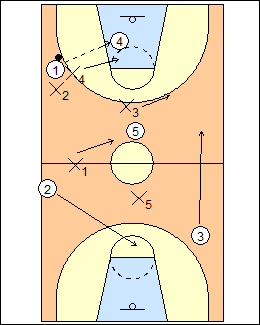 X3 would cover any attacker up the sideline, X5 protects the basket. Dean Smith - if an inbounds pass is made over X2 to 2, X2 can come back to double-team with X1, X5 and X4 would be interceptors, and X3 the goaltender. See Defence - 1-2-1-1 Australia (50 off).